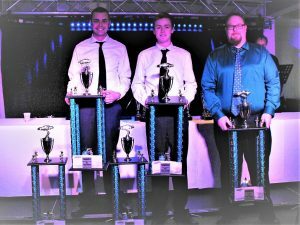 Drivers and teams from the Central Ontario venue commonly known as Canada’s Toughest 3rd of a Mile Paved Oval gathered at The Ranch Resort in Bethany Saturday, December 1st to celebrate a successful 2018 campaign at Peterborough Speedway. A strong performance throughout the year saw Dan McHattie named the Late Model track champion. In memory of Terry Calvert, McHattie was also voted by others in the field as the most sportsmanlike driver. Brandon Feeney was named rookie of the year. Mike Wallace’s #27 was picked as the best appearing car, while Steve Powell took the most improved driver honours for the 2nd consecutive year.